In this comparison article, we’re looking at two cordless stick vacuums; The SharkNinja Shark IONFlex DuoClean, and the Dyson Cyclone V10 Motorhead Stick Vacuum. Both of these vacuums are from very well-known and reputable brands. We’re going to be looking at what distinguishes one from the other, as well as which one is better for your specific needs. Now, before we get into those things, let’s define what a stick vacuum is. A stick vacuum is a vacuum that contains a similar design to that of an upright vacuum. It stands up tall and upright. But, there are a couple of design choices that are noticeably different. The first is that stick vacuums are a lot less bulky. They weigh much less and don’t have the same width or heft as upright vacuums. Now, the second design choice is that, since they are much less bulky, they’re a lot more mobile and easy to maneuver. You can clean much smaller spaces with stick vacuums. And you can move them around with a lot less effort. That’s the beauty of a stick vacuum; they’re versatile. Finally, the third design choice you’ll notice, and this is a byproduct of the aforementioned size, is the fact that they’re not as powerful as upright vacuums. The motors simply aren’t big enough to accommodate the kind of power you would find in an upright vacuum. So, with that in mind, a stick vacuum is a great choice if you need a vacuum that is versatile and flexible. However, if you want power, or if power is a significant concern of yours, these probably aren’t the greatest vacuums. Right off the bat, you’ll notice the Shark IONFlex stick vacuum is light. 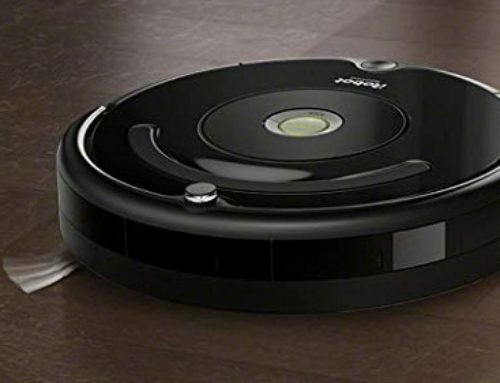 It weighs less than 9 pounds, and since there isn’t any cord to worry about, it’s a very portable vacuum. The battery is known as the “ION Power Pack” and it contains a battery that you can easily remove and take to the charging bay. Now, the versatility mentioned earlier is greatly enhanced by something known as “MultiFLEX Technology.” This technology enables you to move the vacuum underneath furniture more easily. It adds some flexibility to the vacuum. As for the cleaning itself, it’s quite good. On the bottom, there is a bristle brush. This brush makes it easy to clean carpets – of any variety and thickness – and there is another brush roll that is much softer. Now, the soft brush roll is for cleaning a larger variety of hard floors and other surfaces. Sometimes, though, you’ll want to clean spaces that are particularly narrow, or high up. 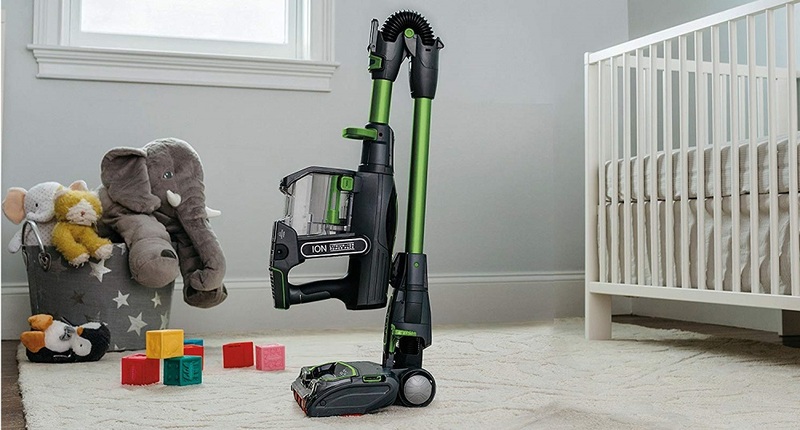 With the press of a button, the vacuum turns into a handheld, making it easy to do just that! Finding a specific battery-life measurement is difficult, but most reviewers have said it lasts 30 minutes. However, the vacuum supports a second battery, enabling you to double that. The Dyson Cyclone V10 is a more “premium” vacuum cleaner than the SharkNinja Shark IONFlex. It costs a bit more, but it’s also a bit sleeker and well-designed. You can see this with the cleaner-head, which makes it easy to remove dirt that has been lodged in your carpet. 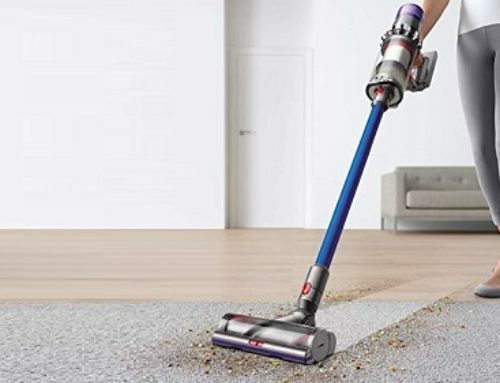 This cleaner-head is powered by a special motor that spins at a speed of up to 125,000 RPM, which is exceptional, enabling the vacuum to clean just about anything. 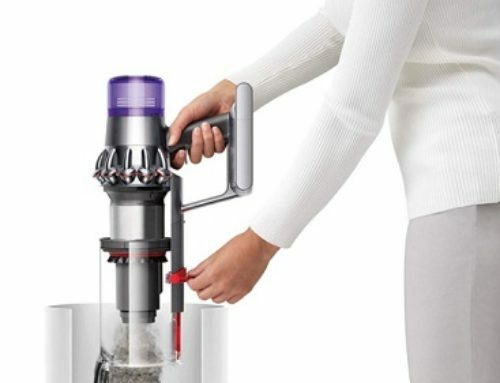 If you want to clean spaces that are high-up or a bit difficult to reach, with the press of a button, you can turn the V10 into a handheld vacuum. However, the V10 is such a light vacuum – it weighs only 5 pounds – and it has a handle that makes it easy to hold it up high. There are also three power modes that you can choose at any time, to make your cleaning a bit more specialized. When cleaning, everything goes through a filtration system that, according to Dyson, captures up to 99.97% of all particles. And then, it expels air that is nice and clean, without the germs and allergens that it had vacuumed up. Using the vacuum on the normal setting gives you 1 hour of battery life. Now, if you change the cleaning mode to the highest setting, this number drops to around 20 minutes. However, due to the mobility of the vacuum, cleaning is a quick process, so 20 minutes to 1 hour should be more than enough time.